SG Tanks is committed to the environment and is regulated by OFTEC to ensure that our record is held as exceptional. As a consequence, we continuously improve our own staffing and environmental performances, and decrease our carbon footprint to help with the overall energy consumption of the planet. All work is carried out by our highly skilled technicians to ensure we maintain complete ownership of our work and that we are able to achieve agreed deadlines. We are able to supply, install and maintain deso bunded oil tanks, plastic oil tanks, single skinned and double skinned and manufacture steel tanks at our plant in Worthing. Call us for more information. Our engineers are also on call 24 hours a day, 7 days a week so should you need assistance we can help whenever you need us. With over 20 years of dedicated oil tank repairs and installation experience, we have developed a superb reputation in the local area of Sussex, Surrey and Hampshire. We provide a complete service where we offer the best prices, customer service and after sales anywhere in the Southeast. 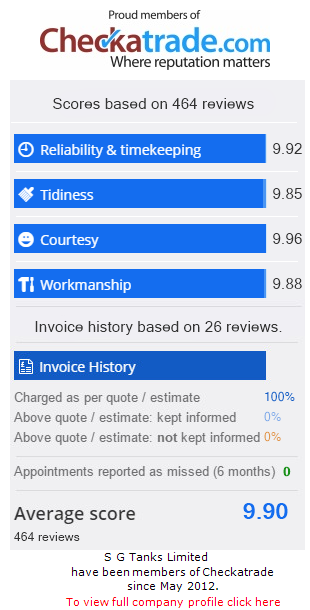 We are also proud members of checkatrade and have a fantastic record for workmanship, reliability and time keeping. Please click the Checkatrade logo to see our customer feedback or call us to discuss any comments.